Ansel Adams is one of the most important figures in landscape photography. His passion for the natural world and for the wonders that could be created by light led him to produce some of the most striking photographs ever made. Adams was born to a wealthy family in 1902 and constantly oscillated in his career ambitions between photography and concert piano playing. 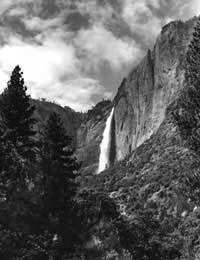 However, the former option prevailed after trips to the Yosemite Mountains, where Adams would create some of his most important images. Adams was fascinated by this landscape, and began taking a Kodak Brownie box camera with him, which had been given to him by his parents. This enabled him to begin developing his striking, pictorial style; this followed the trends that were very much in vogue at the time, which encouraged an emulation of painting in photography. This meant a use of various manipulative techniques in the darkroom. Adams soon met Paul Strand, however, another photographer who had a profound impact on Adams’ work. His influence saw Adams move away from the pictorialism of his early work towards “straight photography”. This meant a rejection of any darkroom trickery and an emphasis on the clarity of both the image and equipment. Soft focus, for example, was shunned in favour of pin-sharp lenses, and prints showed absolutely no sign of manipulation. This progression led Adams to create his most important and well-known works, including ‘Monolith, The Face of Half Dome (1927)’. Soon after this Adams met Edward Weston, another notable photographer, and the pair formed Group f/64. The group was named after the smallest available aperture on a camera, the use of which meant a wide depth of field and an even focus across the entire image. This reflected the group’s aims, which revolved around a desire to create images that showed their subjects as they actually were. F/64 was a response to, and rejection of pictorialism, and insisted that photography must continue to progress in a fashion dictated by the limitations of the medium, and not by the trends of the other visual arts. Adams continued to progress as a photographer, although financial concerns meant that he was also forced to take on a great deal of commercial work. He became known as one of the best commercial photographers of his time, but his desire was always to return to the images that he had been making in Yosemite. Indeed, the Sierra Club, of which he had been a member and which had partly introduced him to the mountains, gave Adams his first one-man show at their headquarters. They continued to support him throughout his career, and Adams continued to repay them by encouraging others to think that the natural world was important via the medium of photography. Adams died in 1984 from heart failure, but he left behind an artistic legacy that is still revered by photographers and art enthusiasts to this day. Furthermore, he developed the ‘zone system’, which continues to be an important contribution to photography, and which is covered in an article elsewhere on this site.